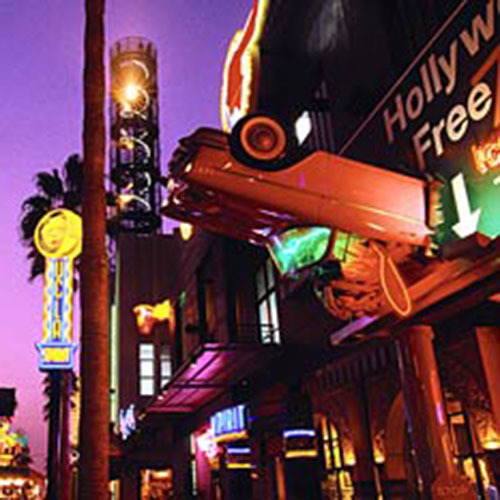 Celebrate Grad Night with your students and friends at Southern California's most amazing amusement parks and attractions. Educational Discovery Tours has put together some of Southern California’s best student graduation celebration hot spots. Disneyland & Disney's California Adventure, Six Flags Magic Mountain, Universal Studios, LA Dodger and San Diego Padres games and Knott's Berry Farm are just a few ideas. Contact our Grad Night planning experts to help you create an event that your Seniors will never forget. Don’t know which one to choose? No problem! We’ll help you make your decision based on the number of graduation senior travelers, your budget and dates. Once you and your seniors identify the celebration destination, we will put together all of the aspects of the trip such as meals, lodging, transportation and theme park access. Educational Discovery Tours wants to ensure the safety of your seniors at all times so a 24/7 onsite tour representative is present at all times. You will also have a toll free 800 number that is staffed 24 hours a day at our headquarters, to call in case of an emergency or if you have any questions. Explore eight fantastic “lands” at the Disneyland Resort. Let your imagination run free in a magic kingdom where life is a fairy tale and dreams really do come true. Come to a drug-free, alcohol-free, boredom-free senior graduation party where the night is all about you. Experience Disneyland rides and attractions and dance the night away in themed night clubs featuring some of the area’s hottest bands and DJ’s. Immerse yourself in a magical festival of shows, parades and attractions celebrating California’s storied past and exciting future. From the gold rush to Hollywood’s golden era to the timeless allure of the beach, discover the vast and diverse Golden State. Get ready to fly at the speed of fear. Soar on the tallest, fastest and longest flying coasters on Earth, including a few record breakers. 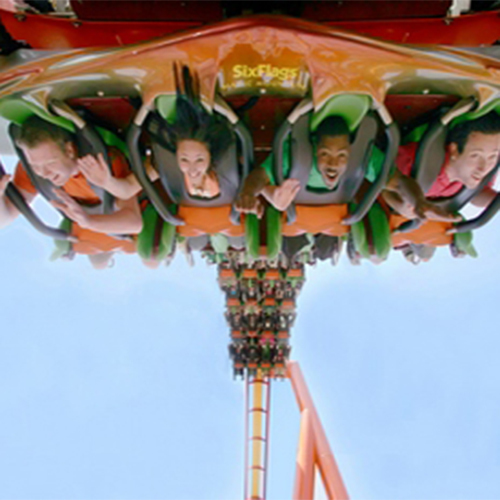 Stand up to The Riddler in the world’s tallest and fastest stand-up roller coaster. Experience the sensation of flying forwards and then backwards on Déjà Vu. Dive into the wet, wild world of Six Flags Hurricane Harbor. At this 22-acre water park next door to Magic Mountain, you’ll splash into a world of fun. 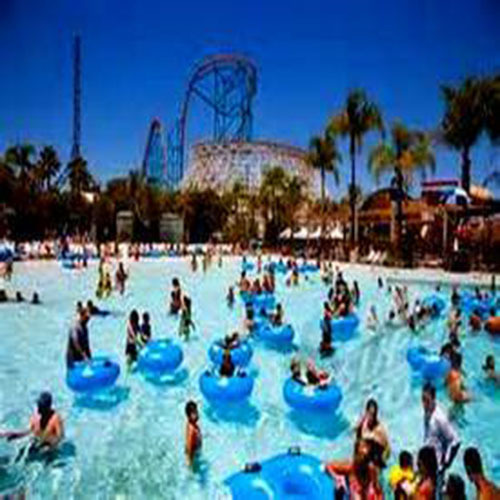 Enjoy two of the tallest fully-enclosed speed slides in Southern California, a 1,300-foot river, and a wave pool. 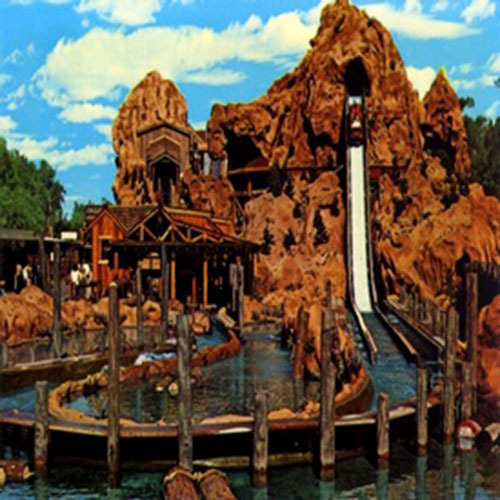 Visit America’s First Theme Park. Experience “Rip Tide” Its “720° of Attitude” will send you soaring 59 feet into mid-air while turning you head over heels in two different directions simultaneously. Only one word really describes it…WILD! 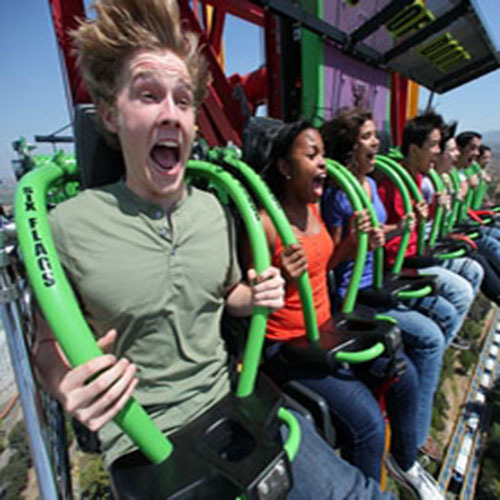 The scream machine, Boomerang, puts you head-over-heels six times in less than 1 minute! Just when you think it’s safe to breathe, it gives it to you all over again — BACKWARDS! Get up close and personal with “living” dinosaurs, a 50-foot T-Rex, and a treacherous plunge straight down an 84-foot death-defying raft plunge on the Jurassic Park ride. The Simpsons Ride won’t disappoint fans. In the House of Horrors, your worst nightmares will come true as you make your way through the dark and windy terror maze. Come face-to-face with Frankenstein, Wolf Man, Chucky, and several of the most frightening characters from some of the scariest horror movies of all time.